A friend and I picked some of the cutest kumquats on the way home from work tonight. Kumquats are small citrus fruits that you can find growing in fancy gardens around downtown Charleston. These little fruits are sometimes bitter, with the skin being the sweetest part. I brought them home to infuse in vodka with some mint growing in my own, not-so-fancy garden. I don't have many uses for kumquats, but I thought this was a pretty good idea. The process is very easy: Wash the fruit and slice in half. 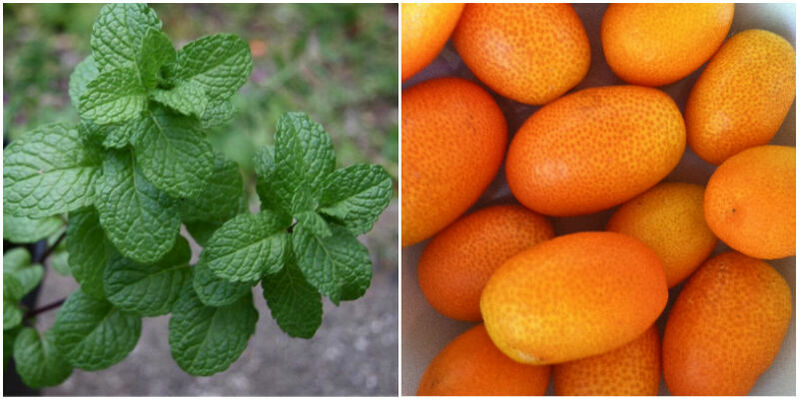 Prepare the mint by rinsing, stemming and chopping the leaves. Place both ingredients in a jar and pour vodka over them. Cover the jars with a lid and place in a cool, dark place for 3 days. The vodka in this recipe could easily be replaced with gin. My jars are in the fridge and are going to be hard to resist! I can now say that I foraged the makings for a drink in downtown Charleston. We talked about mixing this with soda water, but I'm starting to think sweet tea might make a good match. How would you drink this concoction?